Gardenia is a very unique take on the age-old question of whether or not you would choose to know when you were going to die if given the opportunity to find out. It incorporates murder and mystery as well as family and friendship in one highly-entertaining novel. I paired this book, which is all about predestined death dates, with this gorgeous Destiny Bay Mystae wine. This Mystae is a blend of different wines, just like this book felt very much like a blend of different genres. While I’ve definitely seen some stories out there that tackle this same existential concept, I definitely felt like Kelsey Sutton did a great job of putting her own spin on it, and I loved that she integrated a murder mystery alongside it. I would definitely categorize this book more as a contemporary read than a mystery, because I do feel like this was more about Ivy and her journey and less about the murders, though they definitely added an important element of intrigue and excitement to the plot. I really enjoyed Ivy as a character. I felt that her psychology was fascinating to explore, and this book was definitely one that had me questioning how I would react if I was put in the same situation. I love books that make you look at life more philosophically, because they make great books for discussion. I do feel like this book certainly accomplished that. While being very, understandably, standoffish, Ivy is still a very likable and relatable character. It was fascinating to me that she dedicated herself to solving her best friends murder when she knew she only had a month to live, that she chose to pursue something that she felt would give her life meaning over trying to thwart her own fate. I don’t think I would do the same thing in that situation, but the way Sutton depicted Ivy’s character made it so that choice did not push believability at all. It just added to the overall intrigue of her character. I very much liked how important family was in Ivy’s life, and that Sutton really focused on that family dynamic as well as on Ivy’s relationships and interaction with the other citizens of Kennedy. I feel like that focus on relationships is why this book read more like a contemporary for me than a mystery, but it was definitely those contemporary elements that I enjoyed most about the book. I did feel like Kennedy made a perfect setting for this story. I think having it set in a small town where everyone thinks they know everything about everyone, and then SURPRISE one of them turns out to be a serial killer just really added to the creepiness factor. It gives you this sense of the fact that you never know people as well as you think you do, which can be terrifying. I do feel like the mystery fell a little bit flat for me. The ultimate revelation of the killer’s identity was just a little too abrupt and not quite the surprise that I was hoping it would be. But the mystery the murders created throughout the book was entertaining. I did enjoy this book, and I would recommend it as a contemporary read with a bit of mystery sprinkled on top. This isn’t my favorite book cover ever, but I do like it. I like how the artist incorporated the train. It’s very symbolic of Ivy’s impending fate and the feeling she has that she is unable to stop or avoid it. The color scheme also felt very appropriate with the overall tone of the story. I did like the messy and complicated relationship between Ivy and Myers. It was certainly frustrating at points, which made it more real and interesting. 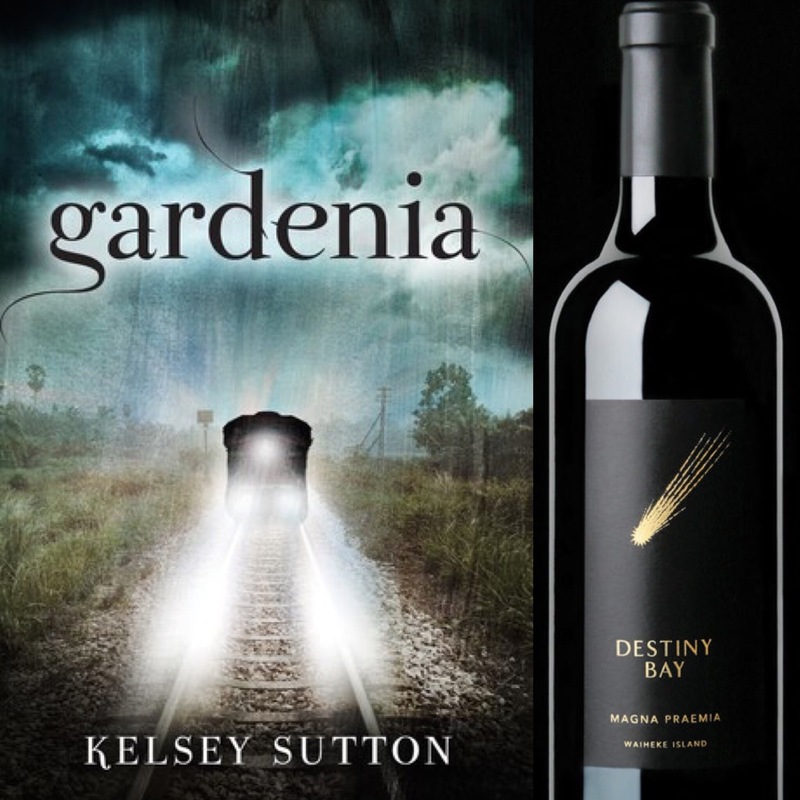 Kelsey Sutton is the author of teen novels SOME QUIET PLACE and GARDENIA. She is also the author of two novels for middle grade readers, THE LONELY ONES and BENJAMIN. She lives in Minnesota, where she received a dual bachelor’s degree in English and Creative Writing from Bemidji State University. She is currently working on a master’s degree from Hamline University. Her work has received an Independent Publisher Book Award, an IndieFab Award, and was selected as a Kirkus Reviews Best Teen Book of 2013. When not writing, Kelsey can be found watching too much Netflix, ordering a mocha at the nearest coffee shop, or browsing a bookstore. You can visit her online at www.kelseysuttonbooks.com, like her on Facebook, and follow her on Twitter @KelseyJSutton. Have you read Gardenia yet? What did you think of it? What are some other books you’ve read that explored the possibility of knowing your own death date? Highlights From the The Daughter of the Pirate King Launch Party! I haven’t heard of this book, but it sounds really interesting. I think I’m gonna try to read it soon, and see what I think about it! I’ll let ya know 😊 Great review! Definitely do! It was an interesting book, and there were definitely elements of it that I was really into. Oh and I’ll have to try that wine too! I super agree that it is far more of a contemporary than a mystery. It got super focused on the that instead of the mystery. Fantastic points!! Exactly. Which I really liked the contemporary elements of the story. I just wish it was like 50 pages longer and had more of the mystery elements too. Then it would have been a four star for me. I’m just now realizing that I never came back to these comments even though I said I did in my head. Sorry for the binge liking here. XD ANYWAY, I super agree with this. If it fleshed out the mystery with those 50 more pages, it would have been such a solid 4 stars! Anytime. 🙂 And it’s fine. I mean, it was a three star, so I like it. I just didn’t LOVE it. It was entertaining. Thank you! I’m so glad you liked the book! It wasn’t my FAVORITE, but I did like it.